It was a magnificent conference…. for the food! On the first night there was a reception with about a dozen freshly roasted turkey breasts. I ate about 4 lbs of turkey flesh and squirreled away another pound or so in my hotel room. When I got to my room, the tryptophan hit me and I passed out on my floor, fully dressed. Woke up thhe next morning just in time to wolf down my stash of turkey breast for breakfast and made it for my morning presentation. The maid must have been surprised to have found my bed untouched. Throughout the week, the conference was punctuated with balefuls of fresh fruit and vegetables. I haven’t eaten this healthily in months. Who knew that a trip to a conference would actually make someone healthier? In the spirit of the moment, I decided to try to jog in “downtown” Winnipeg. I was met with many stares. A friend informed me that since I have brown skin, people probably thought I had robbed someone and were already calling the cops. 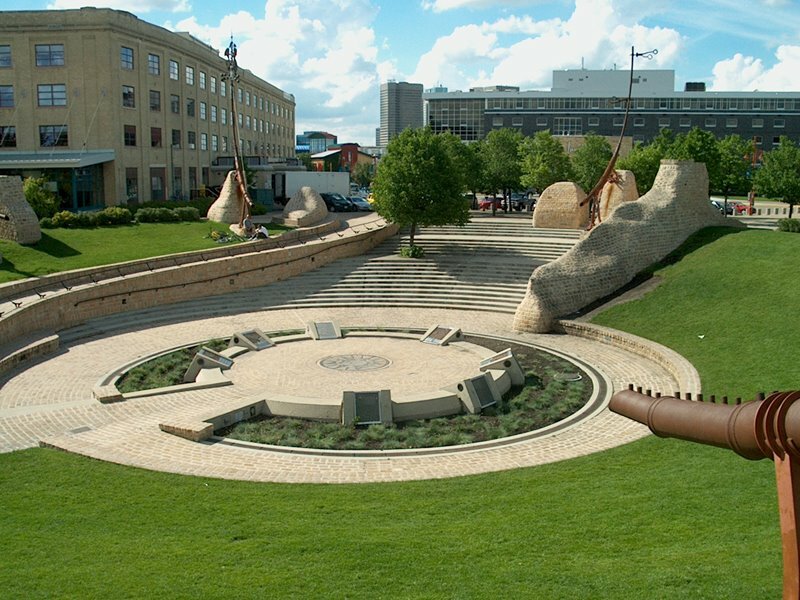 There’s a place in Winterpeg called “The Forks” where, the plaques proclaim, people had been meeting for six thousand years. It’s now a tourist spot, of coourse, complete with a hotel and an upscale minimall. But more importantly, they’ve built this magnificent piece of artwork at the centre of the area. It’s hard to describe, but it appears to be in the style of a paleolithic observatory, with stations around a circle representing the celestial sphere. At three points on the circle, spotlights beam upwards. At night, you can see the beams meet directly above the circle. For lack of a better word, it’s pretty damned cool. Thanks to Rita for showing me around. My interview on CBC radio can be heard here. My segment begins at around the 10 minute mark and lasts about 2 minutes. If you don’t want to stream the episode, you can download it as a MP3 here. The interview (about my Twitter haikus) has inspired CBC to host its own Twitter haiku contest. I don’t think I’ll be submitting an entry. And no, I will not be calling them “twaikus“.